The rather wide waxing crescent moon will be shining in between two brilliant stars tonight. 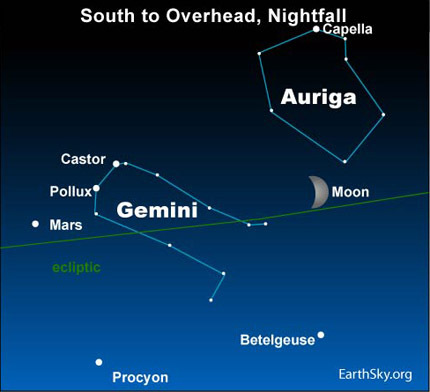 Capella, the brightest star in the constellation Auriga, will be beaming north of the moon, while Betelgeuse, the star marking the right shoulder in the constellation Orion, will be shining south of the moon. The moon swings full circle in front of the starry heavens in a little over 27 days. Twenty-seven days from now – on the night of April 18 – look for a thinner lunar crescent to return to nearly the same spot in front of the background stars. Once again, you will see the moon in between Capella and Betelgeuse. The moon revolves around the Earth on roughly the same plane that the Earth and other solar system planets revolve around the sun. 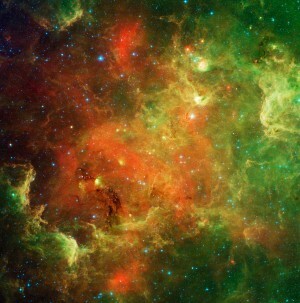 Therefore, we can use to moon to find the planets, because the moon journeys by every planet each month. Two days from now – on March 24 – the moon will pair up with the planet Mars. Six days from now – on March 28 – the moon will couple up with the planet Saturn. You will always find the moon and planets on or near the ecliptic – the Earth’s orbital plane projected onto the sky’s dome.